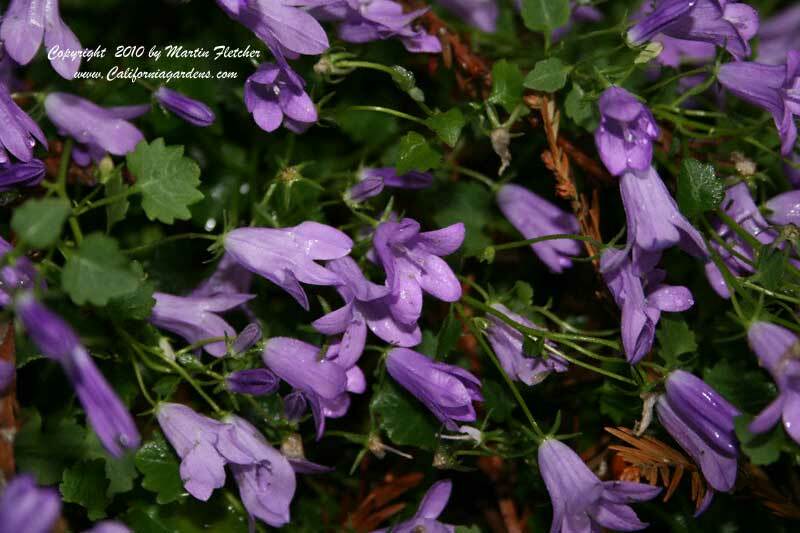 Campanula portenschlagiana is a good plant for the rock garden or for the hanging basket. The Dalmatian Bell Flower has small leaves that provide a fine texture for the small garden space. Campanula portenschlagiana can grow in full sun near the coast but does better with some afternoon shade. Unless the water can is kept at the ready the Dalmatian Bell Flower is best as a shade plant in inland gardens. The lavender blue flowers can cover the plants in Spring and Summer. Campanula portenschalgiana will be hardy down to almost any temperature that California can boast, at least into the mid teens. Good soil and regular water are a must. The Dalmatian Bell Flower was sold under the name of Campanula muralis for a long time and may still be found tagged that way. Flowers and foliage of Campanula portenschlagiana the Dalmatian Bell Flower. High resolution photos are part of our garden image collection.